During this period the kingdom of Armenia was used as a buffer state and as a battlefield by the Romans from the west and the Parthians from the east. 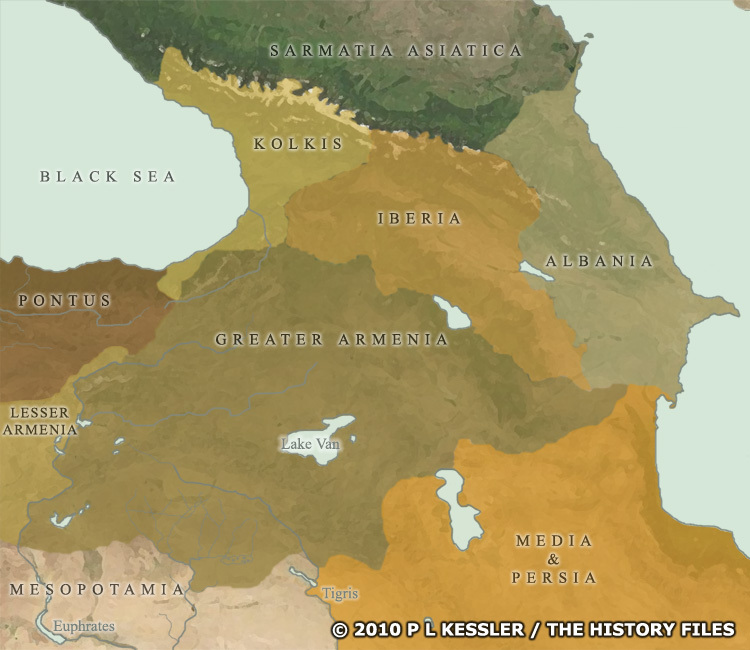 The wars caused the division of Lesser Armenia in AD 56, as well as the further division of Armenia Sophene (not shown here). While this was happening, kingdoms in the Caucuses to the north were forming from largely unknown ancient beginnings and were gaining strength. Iberia and Armenia were closely linked for a time, and at its greatest extent in the first century BC, Armenia reached southwards as far as modern Syria. Pontus was a close ally of Armenia, until it was conquered by Rome in AD 63. During the first century AD, the Alani were a major force in Sarmatia, to the north of Kolkis. They even raided as far south as Armenia around AD 70. The later medieval kingdom of Lesser Armenia was based in Cilicia, on the northern Mediterranean coast of Anatolia, and is only partially shown here. The kingdom of Media was conquered by the Persians in the sixth century BC, but made a brief reappearance circa AD 70 as the Parthian empire fragmented. To select a state for further information, click on its name. Original text and map copyright © P L Kessler and the History Files. An original feature for the History Files. Go back or return home.